In the 1750s Philidor, once more back in Paris, began to make a name for himself as a composer of comic operas. According to his son, it was Rameau who advised him to abandon Church music to devote himself to the music of the stage. It was at this time too that he came into contact with Diderot, with whom he was probably acquainted from the circles of the financier La Poupelinière, and with Grimm. In 1760 he married Angélique-Henriette-Elisabeth Richer, daughter of a composer and herself an accomplished singer. The couple had four surviving sons and a daughter. In 1766 Philidor composed an operatic tragedy, Ernelinde, princesse de Norvège, which, despite mistakes by both musicians and performers, was a great success; he was subsequently awarded a royal pension of twenty-five louis d'or. By all accounts, Philidor was an amenable character, generous to callers seeking charity, and with a certain attractive naivety . His biographer, William Allen, pulls together the evidence to give us a picture of his routine at this happy time in his life (see p.58). Mornings were spent at his desk in absorbed musical composition, accompanied by the unconscious twisting and turning characterised affectionately by his wife as "playing the silk-work". In the afternoons he was to be found regularly at the Régence where a portrait hung over his favourite seat long into the 19th century. His chess playing was also punctuated by fidgeting, and by uncontrolled exclamations - which often disconcerted witnesses who expected a more overtly intellectual demeanor. His engaging simplicity is illustrated by the story that in 1781 Ben Franklin arrived at the Régence with a copy of the Analyse to be autographed. When told he had signed the American ambassador's book, Philidor was in no way overawed, but remarked un-self consciously that he never knew that Franklin was a chessplayer. 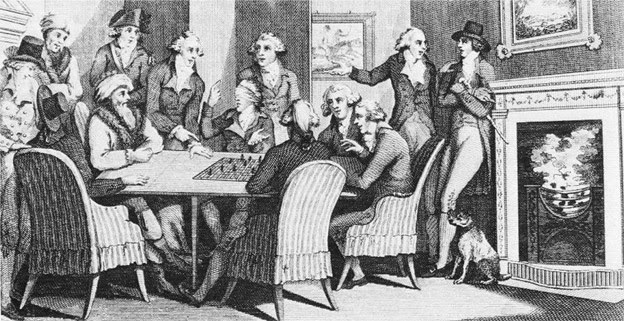 In 1774 new a new London Chess Club was formed at Parsloe's Coffee House in St. James, an exclusive gathering, limited to 100 players and soon identified by Gibbon as one of the "fashionable clubs" of the capital. Members included the the Bishop of Durham, Charles James Fox, the Marquis of Rockingham and "Gentleman Johnny" Burgoyne. The English afficionados soon decided they required the great French player to grace their venture. It was decided that an annual subscription should be made among the members to induce Philidor to spend the "Season" (February to June) in London by providing him with a salary to "defray his expenses". In 1775 Philidor spent his first season in London. 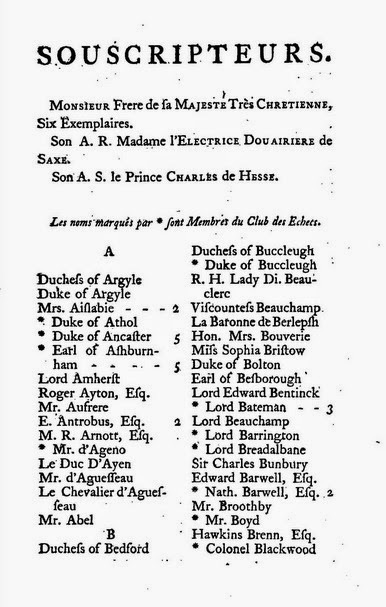 In 1777 a new edition of the Analyse appeared dedicated "to the very illustrious and honourable Members of the Club". There were 282 subscribers, the majority of them English milords. 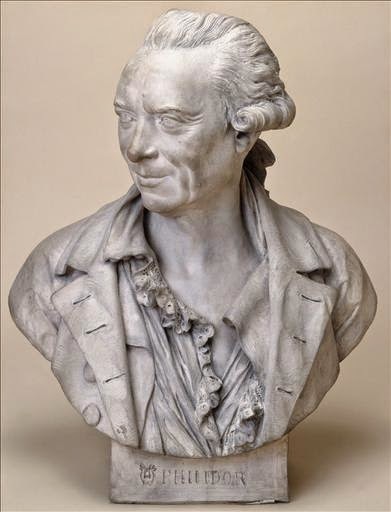 The French subscribers were headed by the Comte de Provence, who was to found the first Chess Club in Paris in 1783, and included the comte de Mercy, the duc de Luynes,Talleyrand and Calonne. Other noteworthy names were the Chevalier d'Éon and, among the plain "Monsieurs" Marmontel, Raynal, Diderot and Voltaire. social engagements.He enjoyed dinners hosted by the exiled Calonne. He may have had his wife and daughter in London with him. The Count de Brühl, London's leading chess player, accompanied him regularly to the Club. Philidor states his intention to send home his salary (at one point he sent home seventeen hundred livres) and live by other income, as far as chess was concerned stakes, fees for instruction and, above all, admission charges to exhibition matches, particularly exhibitions of blindfold chess. 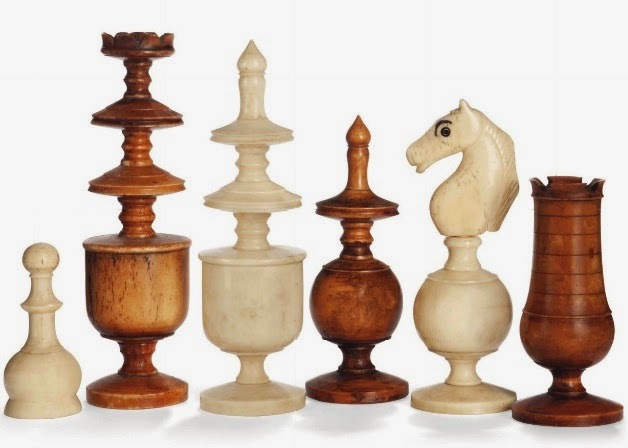 There is a certain inference that towards the end of his career, Philidor was drawn more and more into exhibitions of blindfold chess as patronage began to wane. Certainly the third edition of the Analyse attracted far fewer subscribers than the previous two. Diderot remonstrated with him in 1782, that such "dangerous experiments" risked his talent and his reason. In May 1782 he played two opponents simultaneously whilst blindfolded. Yet on May 28th took on three opponents blindfolded, beating two and ending in a draw with the third. He played two further public matches in 1783 and 1788 and four in 1789. In 1790 the Club decided there should be a dinner preceded by a blindfold match at Parsloe's every other Saturday. to his wife, from February 1790, as "a pleasant exercise of hope and joy" and supposed that before July France would secure the admiring respect of the universe - lawsuits would be few, taxes would be reduced by a third and the public debt honestly repaid. He was confident too of moral regeneration; the education of youth would be reformed and French people would discourse on grave subjects rather than give themselves over to frivolity and nonsense. He admired Lafayette and was happy that his sons were enrolled in the National Guard. However, by 1792 as the Revolution progressed, Philidor, with his close ties to royal patronage, felt it a sensible precaution to obtain a passport and leave early for the season in England. Here he resumed his customary round of matches and watched the Revolution unfold from afar. As late as February and March 1794 he could be seen playing three matches simultaneously, two of them blind. In 1795, by now ailing and afflicted with gout, Philidor tried to return to his family in France only to find himself proscribed as an émigré . He announced his last public match for 20th June and died brokenhearted on 31st August 1795, never having heard that his passport home was finally granted.